You’ll check in at our guest center where you can learn fun facts about the city and its history. Once aloft, you'll glide through the air in one of our luxurious, state-of-the-art aircraft. Our experienced pilots are well versed in the lore of the city, which they’ll share throughout your 24-mile journey. You’ll marvel at breathtaking vistas of the skyline, Navy Pier, Millennium Park, Buckingham Fountain, Willis (Sears) Tower, John Hancock Center, Wrigley Field and so much more. Bring your camera for the optimal photo ops or utilize one of our GoPros to record your exhilarating adventure. A photo to commemorate your experience will be available for purchase. Chicago’s beauty is legendary. At night it’s positively magical. You'll remember our Night Tour’s stunning views of the glowing cityscape for years to come. You’ll depart from our downtown heliport, just minutes from the “Loop.” Before your flight, enjoy fun facts on the history of Chicago and “pilot an aircraft” from the interactive flight simulator in our 6,000 square-foot guest center. Then, take off! 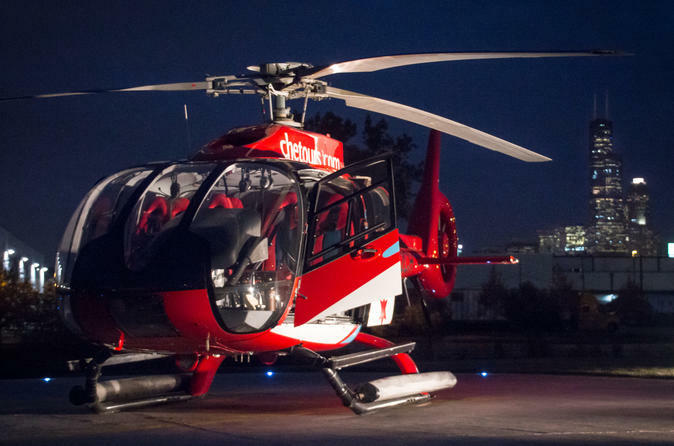 Marvel at the sparkling lights adorning the city as you glide through the night sky aboard one of our state-of-the-art helicopters. Catch Buckingham Fountain’s glimmering light show in the summer or Michigan Avenue ablaze at holiday time.Take in the majestic sight of glittering buildings along the lakefront. You’ll see Navy Pier, luminous along the shoreline, colorful lights from magnificent skyscrapers reflecting onto the Chicago River, sparkling Millennium Park and Soldier Field. Fly along the coastline to view Chicago's famous Lincoln Park Zoo Lights festival, Lakeview, and historic Wrigley Field--home of the champion Chicago Cubs. As you glide across the city your pilot will share facts and folklore that bring Chicago to life.